HEATING OF WATER THROUGH HEAT EXCHANGER. The RODABE INGENIEROS static autoclave bases its operation on the transmission of heat and cold by means of water in recirculation, through a plate exchanger. - Maximum working temperature: 140 ºC. - Maximum working pressure: 4 bar. - Machinery built under CE regulations. 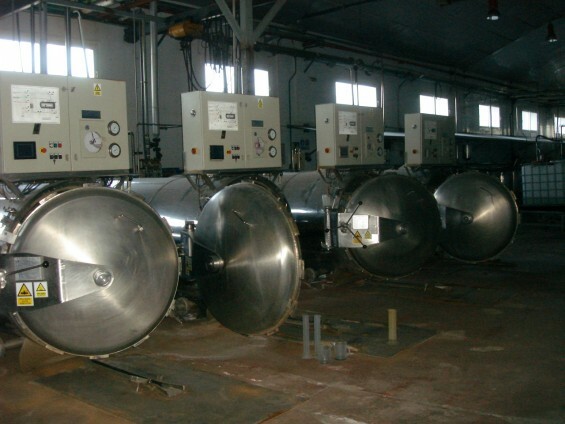 - Heating and cooling of the product by means of waterfalls or sprays of water in recirculation. - The water, by means of a pump, makes it pass a plate exchanger in stainless steel for indirect heating of the same. - The heating and cooling of the water, which is used in all the cycles of the process, is carried out in the plate exchanger by means of steam or cold water. - Autoclave equipped with process automation panel. Canned vegetables, pasta, pre-cooked foods, juices and beverages, meat products, pates, fruit preserves, fish. - Electric control and maneuver board NEW. - Plate heat exchanger NEW. - All NEW work valves. - NEW control and measurement equipment. In these moments we do not have baskets and cars, we would have to manufacture them.